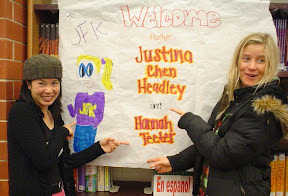 But here I am, a novelist for young adults, in the middle of my Girl Overboard book tour with none other than Hannah Teter (said blonde, twenty-one year old Olympic Gold medalist and Burton pro rider). To tell you the truth, our age—and athletic—difference vanishes the second we talk to teens about how much we need them to go overboard and change the world. Now. Today. We’ve been traveling the country, rallying teens in suburbs and inner cities to embrace the power of their words and their ideas and their actions. To tell teens that they aren’t just tomorrow’s world-changers; they, like Hannah, are today’s changemakers. Case in point: Hannah Teter. At all of eighteen, Hannah won the 2006 Olympics in snowboarding halfpipe and celebrated by taking every penny of her winnings and creating a non-profit organization to help AIDS orphans in Kenya. AIDS orphans! In Kenya! That’s the type of change I wrote about in Girl Overboard —how one person, one so-called “kid,” can rock the world. I learned that myself when I was just ten and outraged that hunters were bashing baby seals to death to turn them into fur coats. Let’s just say that Shakespeare had it all wrong with the whole woman scorned bit. Apparently, he had never beheld the fury of a fourth-grader with a pen in her hand. Off went my outraged letter to the editor of my hometown newspaper. My friends scoffed. Even my parents were doubtful that my words could make a difference. Guess what? My letter was published. And in letters that followed mine, adults chimed in, agreeing with me. Me, a little girl of ten… Yes, our words can agitate for change. Fast forward to today. I don’t just publish my novels; I tie community service to every single one. I want to nudge my readers who are predominantly teens to use their words—whether to win a college scholarship or to change the world itself. 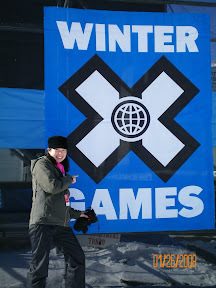 along with Youth Venture (www.genv.net) and Burton Snowboards. We’re giving away 12 grants, $1000 each, to fund the best youth-led ideas to change the world. So tell a student aged 12-20 who’s fired up about a problem, whether it’s environmental or societal or MomsRising related. Urge them to create a team, write up a proposal, and submit it to us. The best ideas will be funded. For more details, be sure to check out www.burton.com/GoOverboardGrant (click on U.S. and you’ll be taken to the grant) and our YouTube video at http://www.youtube.com/watch?v=-FGgsDxo07I. So do that, and I can stop touring to get the word out about the Go Overboard Challenge Grant. (Translation: I can touring with a fit, beautiful blonde who’s half my age, thank you very much.) But I do have to say, I feel rocking good in my new snowboarding duds, good enough to shred the bunny hill. Justina Chen Headley is the author of Girl Overboard and won the Asian Pacific American Award for Literature in 2007 for her debut novel, Nothing but the Truth (and a few white lies). She co-founded readergirlz, the foremost online book community for teen girls and encourages you to visit at www.readergirlz.com. For more info about Justina, please visit www.justinachenheadley.com or contact her at www.myspace.com/JustinaChenHeadley.